London String Quartet Week is organised by the London String Quartet Foundation, whose mission is to promote the discovery and development of talent and audiences for the string quartet. The Invitation Jury invited thirteen quartets to London to compete this year, and during the preliminary round at RAM I sampled the playing of about half of those. 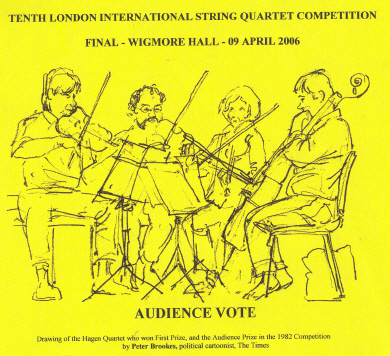 Each quartet gave two hour-long recitals, including their choices of any one of Haydn's Op 64 or Op 76, one of the ten late Mozart quartets, plus Wolf Italian Serenade in G major, Webern Six Bagatelles Op 9 and Kurtag Twelve Microludes Op 13, the last three of which were the Competition set pieces. So during the first four days the eminent 9-strong jury listened to 26 recitals, some in the acoustically suitable Duke's Hall, most in the cramped and overcrowded David Josfowitz Hall which, so great was the public interest, had to adopt a queuing system - five out after a session, five in! I thought five of those quartets I heard during this stage excellent and two superlative; only one left me wondering why they had been invited, but it was good to have explored the range of talent, as I had done in each of the previous competitions since it moved from Portsmouth to London, first to Goldsmith's Hall, latterly to RAM. Of the two we had heard in the Preliminary Round whom we rated "superlative", the Zemlinsky Quartet went on to win Third Prize and the Audience Prize in the finals but the other (Asasello Quartet, currently based in Cologne) fell by the wayside at the first hurdle. We had enjoyed both in Haydn Op 76, the Zemlinskys for eye contact mediated by the 2nd violinist, the Asasellos for a perceived quality of 'thinking' whilst playing, as against replicating a digitally perfected interpretation. Both gave pleasure in the well chosen set pieces, the Asasellos marginally more for their joyous, high risk Wolf Italian Serenade and for a subtlety in Webern's tiny Bagatelles which brought smiles of delight. Both of these splendid ensembles have CDs for sale which quartet fanciers would do well to acquire. the best performance of a Mozart quartet in the Preliminary Round. (Wolf, Webern, Kurtag) in the Preliminary Round. Martin Lovett (cellist of the legendary Amadeus Quartet, which gave its debut recital in Wigmore Hall 1948) spoke of the rising standards and the "pain" for the unfortunates. Also how string quartet playing ought not to be a competitive sport - wishful thinking in the present competitive climate in which musicians of superb accomplishment cannot even be assured of making a living! By way of consolation he told us that Andras Schiff had got 5th Prize at Leeds, and Norbert Brainin failed his LRAM !! My own vote at the Final for the Audience Prize went to the Sacconi Quartet for a riveting account of Britten's still challenging 2nd Quartet; remarkable to recall that at its first performance (Zorian Quartet, November 21, 1945) those of us present in Wigmore Hall found the glissandi passage in the first movement bizarre, indeed freakish - extended string techniques had not yet jumped across the Channel from Europe! I have attended and reviewed every competition held in London since 1991. For an overview of this illustrious competition founded by Sir Yehudi Menuhin and Richard Sotnick in Portsmouth 1977, please click onto my link to the 9th LISQ competition, which includes Appendices about the THE COMPETITION PROCESS, the most subtle and transparent of any I have encountered (c.p. our analysis of the marking of an international choir competition in Rhodes). Illustrated Talks, Free Lunchtime Concerts in some of London's most beautiful churches; Masterclasses, Exhibitors' Stalls. Click here to see the full programme for the Week. The programme book is well worth acquiring from LSQF as a source book for future reference; the next LISQ will take place in April 2009. One response below; Musical Pointers would welcome further reactions from e-listeners? - - hearing one work being played by each ensemble in the final round is an insufficient basis for making a rounded judgement. Your written words about the Zemlinksy, together with the performance I heard this evening, will prompt me to enquire of their agents as to whether any tours of Britain are planned in 07/08. Finally, thank you for your reviews. It is so difficult to get anybody to stick their neck out and give a critical opinion these days. - - Apart from your website, I see nothing that is critical or informative. Keep up the good work.